I loved making this spring pop cake using my meringue cookie recipe and my homemade lollipop recipe. This design is trending on Instagram but I had no idea what to call it! I was totally inspired by the work of Instagram.com/annabel_bakery for this cake design. 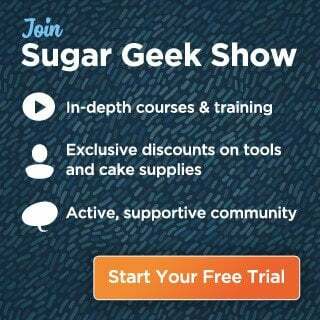 What do you need to meringue pops? 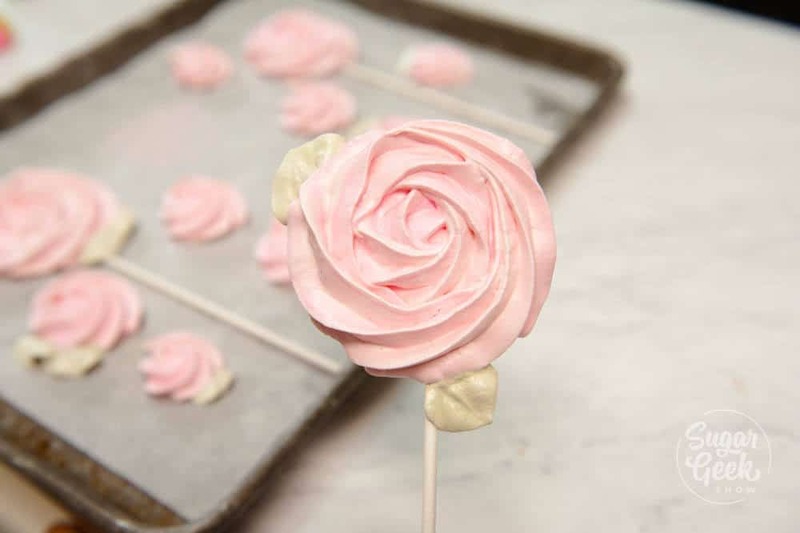 To make your rose meringue pops you’ll need to whip up a batch of my meringue cookie recipe. I used electric pink and avocado green food coloring to color my meringue pop roses. Place your lollipop sticks on the parchment paper and pipe your rosettes over the top of the sticks. Add a couple of leaves to the outside. Pipe the extra meringue into small rosettes in between the lollipops. Bake your meringue pops at 225ºF for 90 minutes. DO NOT OPEN THE DOOR. Just turn off the oven and leave them in the oven until the oven is completely cool. I just leave mine in the oven to cool overnight. Be careful not to turn the oven on the next day and burn them! What do you need to make lollipops? To make the lollipops, start with my homemade lollipop recipe. Pour your prepared lollipop mixture into 3″ circles on top of your silicone baking mat and add your lollipop sticks. Then add your sprinkles. Let cool completely before removing from the silicone. 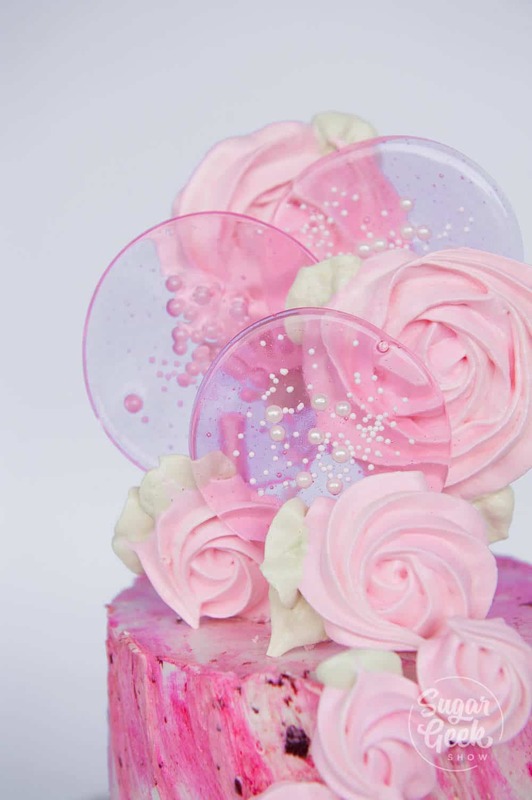 Torch the back sides of the lollipops to make them crystal clear before adding them to your cake. To make the cake, start with a frosted and chilled 6″ cake. If you need more info on how to make a cake, check out my how to make a cake tutorial. Combine 1/2 cup of easy buttercream with about 3 Tablespoons of strawberry puree. Mix the two together but not all the way. Spread the puree on the top 1/4 of the cake roughly. 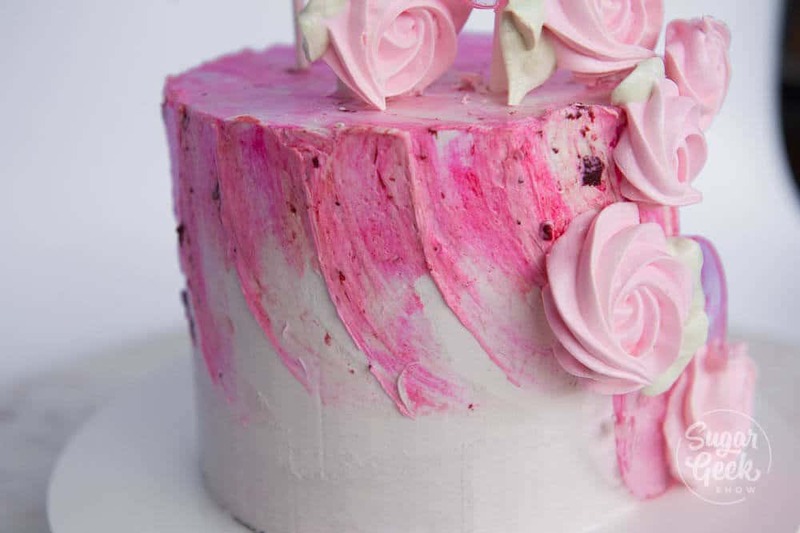 Then use your spatula to swipe in a downward motion to drag the buttercream in a painterly effect. Now the fun part! Adding the meringue pops and lollipops! I started with the meringue pops and alternated with the lollipops. 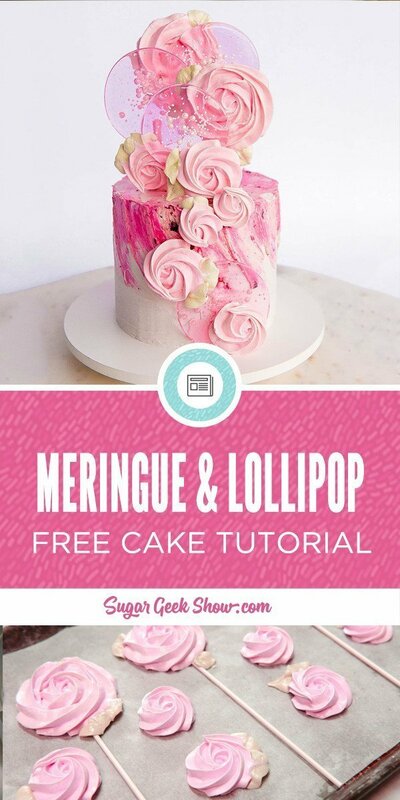 Add the leftover meringue pops on the cake to fill out the empty space. That’s it! I love how this fun and festive cake turned out. 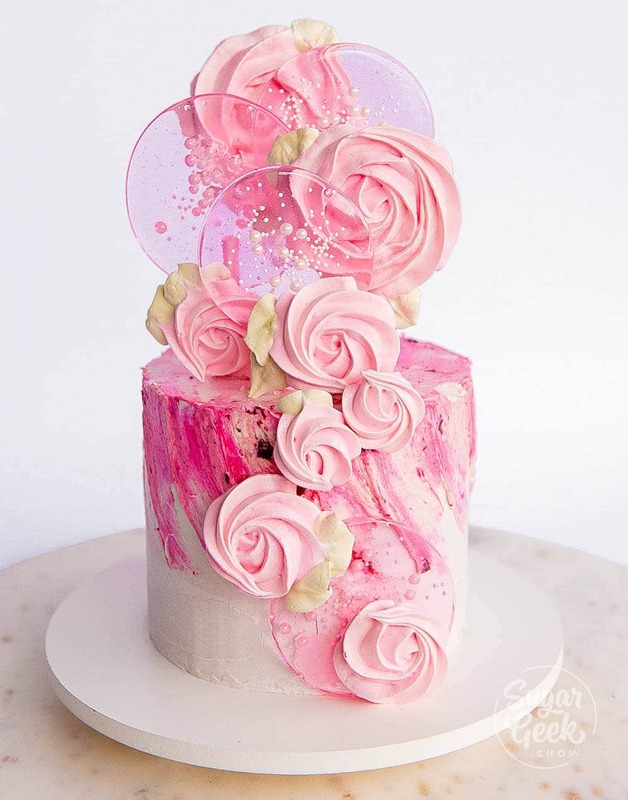 I think it’s the perfect cake to make for spring!